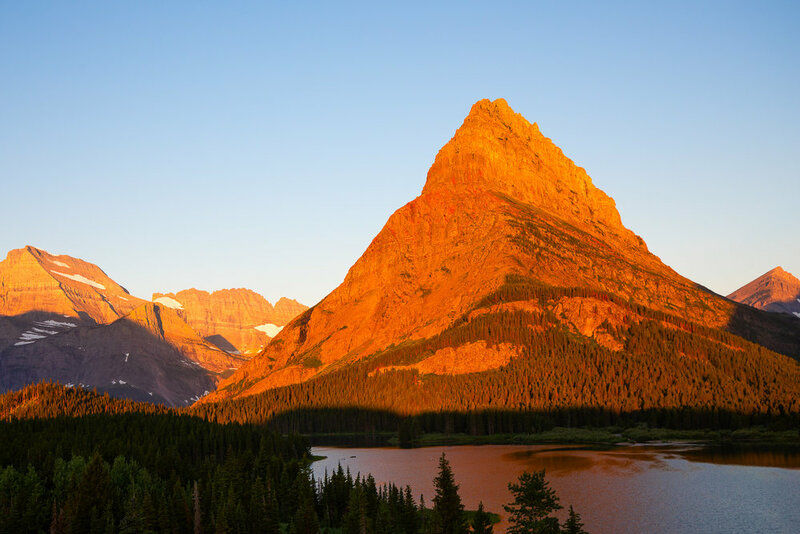 Sunrise over Grinnell Peak in Glacier National Park. After breakfast, our group had reservations on a boat (actually two boats) to get closer to the Grinnell Glacier trailhead. 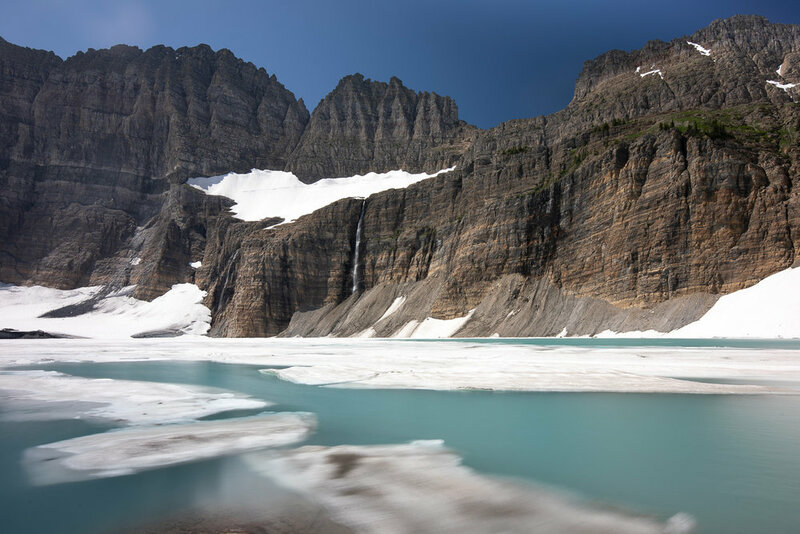 The two historic wooden boats—Chief Two Guns on Swiftcurrent Lake and Morning Eagle on Lake Josephine—brought us to the Grinnell Glacier trailhead. The two lakes are only 0.2 miles apart. 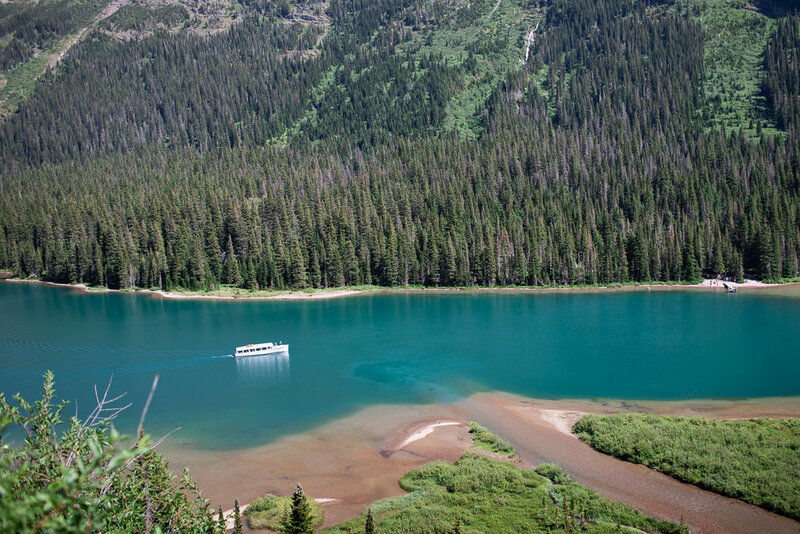 The Grinnell Glacier hike is about 7.6 miles round trip from the upper boat dock on Lake Josephine (see photo below). Otherwise, if you opt not to take the boat, the hike is 12 miles round trip beginning at the Many Glacier Hotel trailhead. 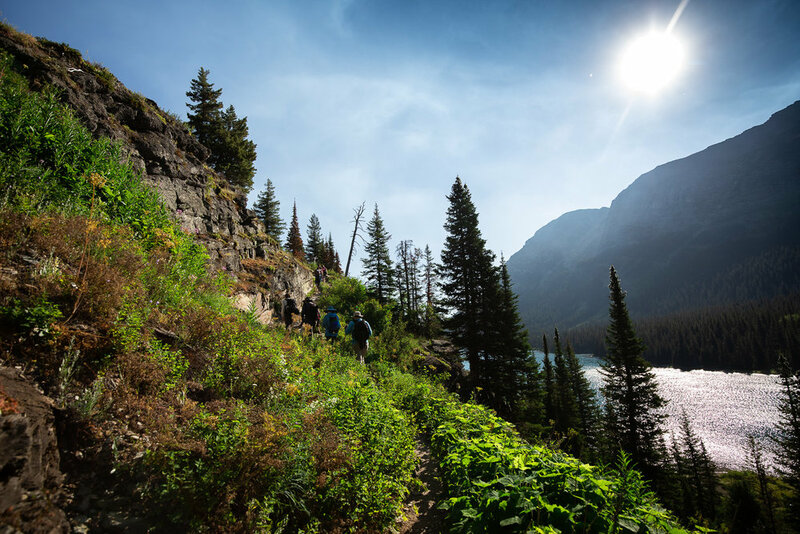 Passengers departing the Morning Eagle on their way to traverse the Grinnell Glacier trail. The beginning of the Grinnell Glacier hike. Views from the Grinnell Glacier hike. About 3/4 of the way to the Grinnell Glacier, one will come across a waterfall. Those that aren't afraid of the slippery rocks can veery toward the left and get little exposure to the waters. Others, perhaps afraid of heights, braced for a little cooling off, as seen in the below two photos. This portion of the hike is one of the congested spots. 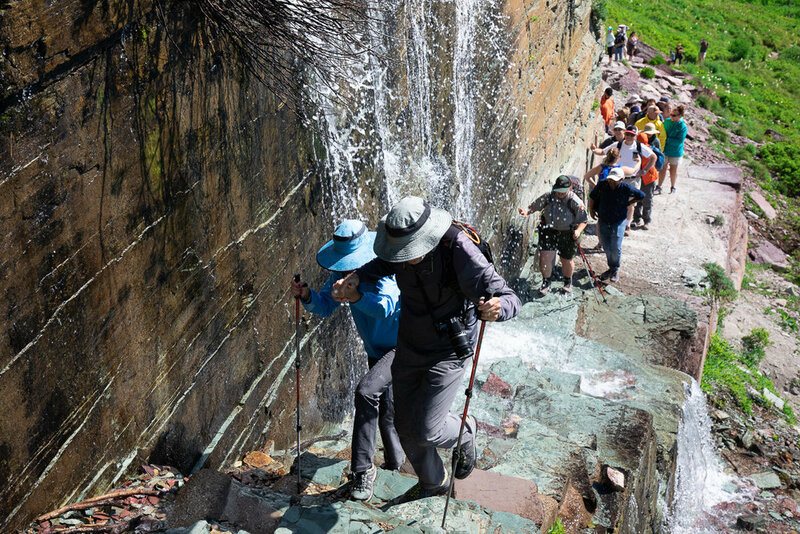 Walking through a small waterfall on the Grinnell Glacier hike. Made it! A waterproof jacket and quick-drying pants are helpful. Another thirty more minutes and you come across the Grinnell Glacier and Upper Grinnell Lake. Our group spent about an hour here, capturing photos and walking on the edge of the lake. 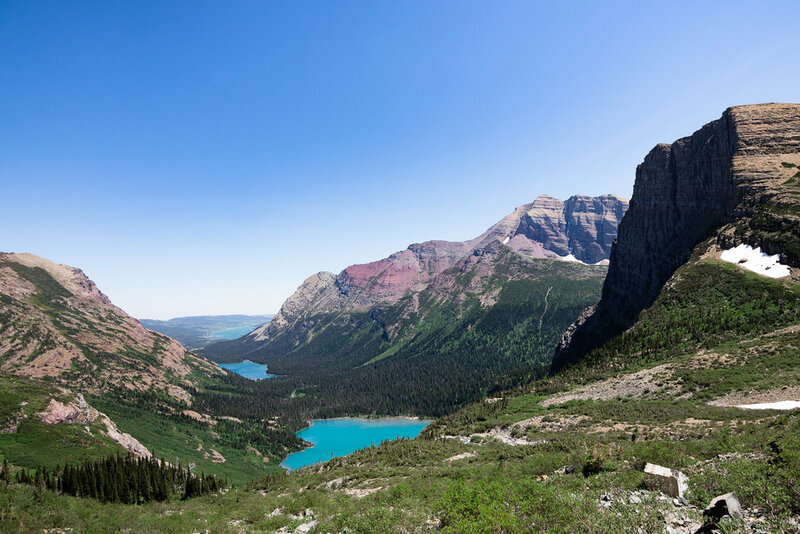 Final destination: Grinnell Glacier and Upper Grinnell Lake. On the way back, the sun was high up in the sky, which made the deep ceruleans/turquoise colors of Grinnell Lake incredible to behold. 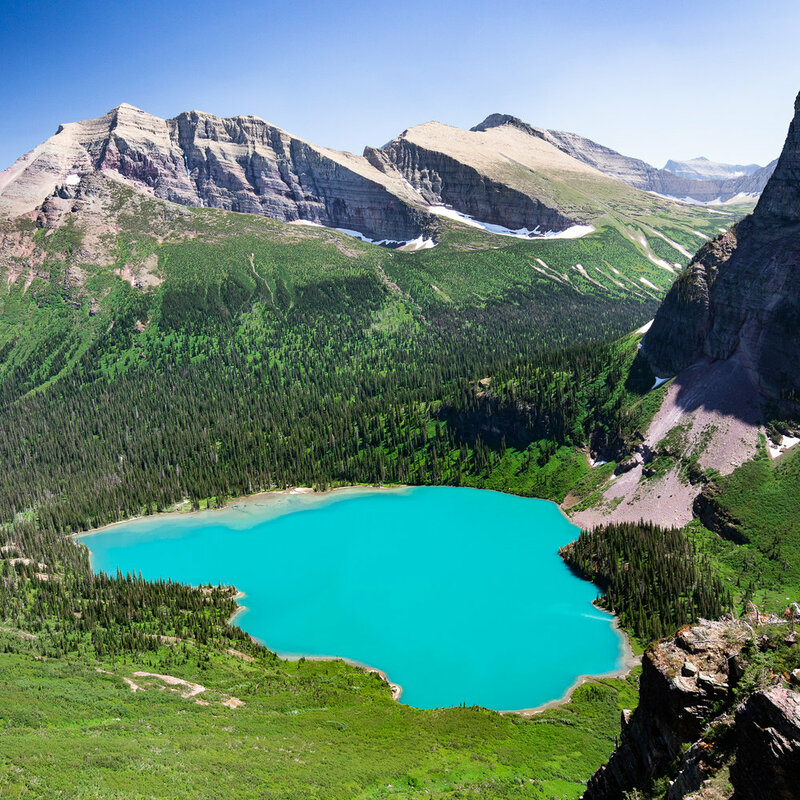 The turquoise color of Grinnell Lake in Glacier National Park is a result of "glacial milk," a suspension of fine particles of limestone (calcium carbonate) ground by glacial movement from the Grinnell Glacier over a limestone bed. In the photo below, you can make out the stream of glacial waters entering the lake near the bottom right corner. I hadn't seen colors like this since my trip to New Zealand. Deep turquoise color of Grinnell Lake. A view of Grinnell Lake, Lake Josephine, and Swiftcurrent Lake from the Grinnell Glacier trail. At around 3:45PM, the Morning Eagle was on its way to pick up passengers on Lake Josephine. Our boat would arrive thirty minutes later. The Morning Eagle arriving to dock at Lake Josephine. Aboard the Chief Two Guns, I ended the afternoon by taking photos of the renowned Many Glacier Hotel. Many Glacier Hotel as seen from aboard the Chief Two Guns.